A carbon fee and dividend approach would achieve all of these goals. By applying a steadily rising fee on the carbon dioxide emissions impact of a given carbon-based fuel at the point where it enters the US economy—the mine, the well or the port of entry—we can ensure that the price correction starts with the parties responsible for introducing that fuel into our energy markets. By returning 100% of the revenues as a dividend to every household, every month, in equal shares, we can ensure that the solution spans the entire marketplace. A January 2013 Compustat analysis found that US corporate cash holdings for 2011 stood at $4.97 trillion. That’s almost $5 trillion waiting for a clear market signal that will allow for smart investments over the short, medium and long terms, in a growth industry no economic slump will be able to phase out. The brilliant economic logic of the clean energy marketplace is that once you establish a way to power your entire economy from clean, renewable resources, that clean energy marketplace will not go away. A clear price signal to investors will draw trillions of dollars in new investment into the race for meaningful, profitable long-term leadership in a free and open, decentralized, quality-of-service-based clean energy marketplace. The year is 2013; recovery from the Great Recession of 2007-2009 is now into its fifth year; job creation is getting back to normal, but we need a major new investment in technology and infrastructure to finally transcend the malaise of the fallout from too-big-to-work derivative finance. A revenue neutral carbon fee and dividend gives no money to government, creates no new bureaucracy, may relieve EPA of the need to enforce CO2 emissions regulations, invites huge amounts of private capital into a nascent but necessary and transcendent marketplace, creates millions of new job opportunities, creates for the first time the possibility of a real free market for energy, and bolsters the middle class. To ensure foreign corporations don’t have a pricing advantage, a border adjustment is applied to products and services from any country that does not implement a similar fee. This not only makes sure American businesses get to play on a level playing field, it also motivates the international propagation of emissions reducing market correcting policies. This means it is our best chance (and by far the most affordable way) to achieve global consensus on how to reduce emissions and free future generations from catastrophic climate destabilization. To build new infrastructure for unconventional extraction of natural gas and oil will cost us more than what it will cost us to develop true a clean energy marketplace, and it will be money lost, because we will eventually have to replace the finite-fuel infrastructure with renewable-fuel infrastructure. Every year we wait is estimated to cost in excess of $100 billion, money wasted in service of a rigged market that is holding our nation back economically. 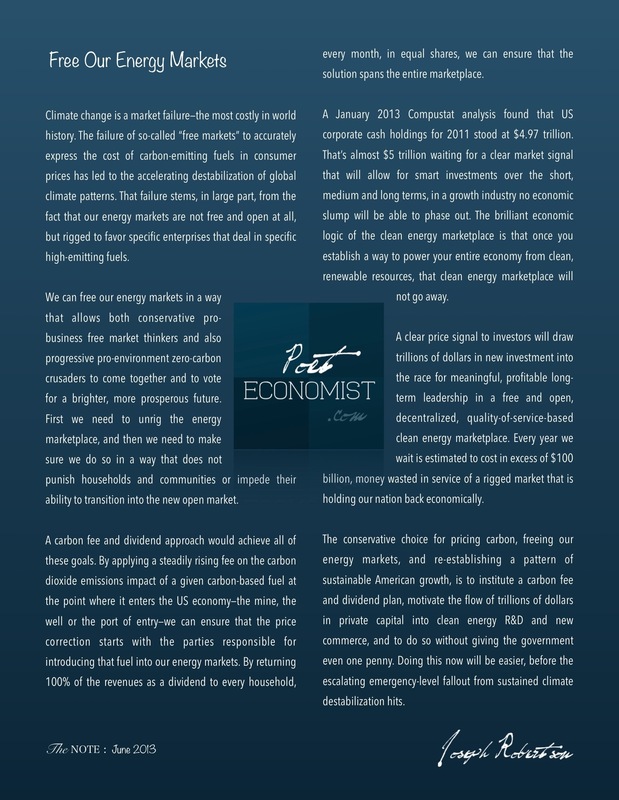 The conservative choice for pricing carbon, freeing our energy markets, and re-establishing a pattern of sustainable American growth, is to institute a carbon fee and dividend plan, motivate the flow of trillions of dollars in private capital into clean energy R&D and new commerce, and to do so without giving the government even one penny. Doing this now will be easier, before the escalating emergency-level fallout from sustained climate destabilization hits. Citizens Climate Lobby is bringing non-partisan volunteers from across North America to Capitol Hill on Tues., June 25, to ensure the message gets to every elected official in Congress. The specific commercial interests invested in the prevailing energy model have so far persuaded mots policy-makers to endorse the globally limiting, low efficiency fossil fuel model. Citizen volunteers are now working to correct perceptions about efficiency and reliability, and to reframe the economic debate, in favor of the middle class, energy market freedom, and clean, high efficiency technologies. Ensuring that businesses that choose the old, expensive, inefficient model of pervasive constraint pay a fee to everyone else, will allow energy markets to tell the truth about costs, and rapidly move to sustained, expanding everywhere-active efficiency.